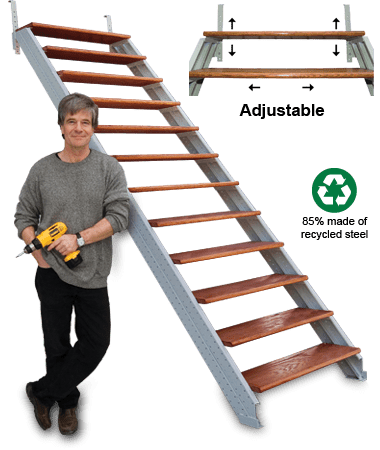 Fast-Stairs are adjustable steel stair stringers; simply screw step/treads (not included) to engineered stair stringers to build solid, square & plumb, free-standing stairs. Designed for fail-safe stair building for all, our 32 models can frame 2½ to 13 ft stairs. With perforated steel stringers you can fasten any stair finish materials you can find locally. Contrary to wood, dimensionally stable steel stringers won’t warp, crack, split, rot or shrink. All starter packages contain left and right 16 gauge, double C channel, top and bottom welded steel stair stringer sections with middle slide connectors, 11″ height adjustable 1/4″ steel extra risers top hook straps (all powder-coated) and all zinc-plated connecting fasteners. Two-step extensions are also included in many of our Fast-Stairs kits (Ex: An A6 kit includes an A4 and a A2; a B14 kit includes a B10 and two B2s, see assembly tutorial video for details). Fast-Stairs are both permanent and re-usable and easy to customize. Step/treads, railings and risers are not included with our stringers. Customers make or get those locally to their taste and budget. All pictures on our website were sent by customers having gone through this process. Fast-Stairs specialises in providing what is the hardest part in building stairs (the frame) and what can’t be found elsewhere: modular adjustable steel stair stringers. Fast-Stairs offer do-it-yourself stair solutions for consumers, re-modelers, builders and contractors alike. There is no easier, faster or better way to build super strong and economical stairs. The top step/tread in any staircase can be level with the top floor/level, as long as it is as wide as the top floor/level opening. All Fast-Stairs starter 10 step models come with height adjustable (every 1/4″) steel top hook straps which allow for one extra stair riser. Most building codes allow a 2° slope AND a 1/4″ variance between any riser heights, thus allowing a combined 2 1/2″ to 3″ additional adjustment up or down.